Old Gunnar’s Solskjaer’s unbeaten start to life at Manchester United came to an abrupt end as PSG won 2-0 at Old Trafford on Tuesday night. Paul Pogba was also sent off as Angel Di Maria returned to haunt his former club and help Paris St Germain take control of this Champions League last-16 tie. The first competitive encounter between these sides went the way of the visitors at Old Trafford, where the Norwegian’s first European game in charge saw the end of his 11-match unbeaten start to life in the hotseat. PSG may have been without Neymar and Edinson Cavani but they boasted a player with a point to prove against United. Di Maria rose to the occasion amid the jeers to superbly provide assists for Presnel Kimpembe and Kylian Mbappe in a comfortable 2-0 first-leg win for the visitors. As if Solskjaer’s men were not already facing a mountain to climb on March 6, Pogba will miss the trip to the French capital after picking up a late second booking to compound injuries to Jesse Lingard and Anthony Martial. You can follow how all the action unfolded at Old Trafford via our Live Centre. PSG failed to muster a first-half shot on target as United held their own at the start, only to wilt as Di Maria made light of rough treatment from former team-mates and fans. Signed for a then-British record fee in 2014 and sold after one poor season, he helped Thomas Tuchel’s side go ahead as Kimpembe turned home his exceptional corner delivery in the 53rd minute. Di Maria’s pass was then swept home by Mbappe six minutes later to leave United flailing, with David De Gea producing some fine stops to prevent their difficult task in France becoming impossible. But Pogba’s second yellow card at the death may have just swung the balance. 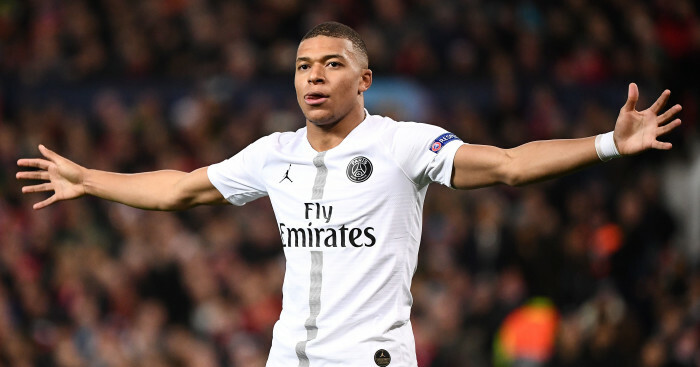 The post Pogba sees red as PSG outclass Man Utd in Champions League appeared first on teamtalk.com. Who’s your NFL Draft crush?